Speedway in New Zealand is run on a clay based oval track 400 metres long surrounded by a concrete wall, there are over 20 tracks and stadiums around the country with meetings held in the summer months from October to April, Speedway New Zealand (SNZ) is the governing body that sets the rules and guidelines, there are international classes like Sprint cars, Midgets and Solo Bikes which compete along with unique grades to New Zealand like Stock cars, Super stocks and Modifieds. Meetings are normally held on the weekends with many tracks racing under lights at night, the two major types of racing are contact and non-contact racing; contact classes are able to hit each other on the track within the rules of the grade they race, Super Stocks are the elite class, a v8 240 cubic inch engine built within a 1500kg steel frame designed to hit, they have bumpers front and rear and side rails to protect the chassis, they often race in teams, where stopping the opposition is the key to winning, it would be one of the most aggressive forms of motorsport in the world. The non-contact classes are spilt into 3 with saloons, open-wheeled and bikes, the saloons have a more car-like look while the open wheels generally run with wings and wide tyres on the rear for better traction and speed. There are various grades of saloons; the production grade is basically regular cars that have a roll cage put in. with glass and lights removed, to the elite Super saloons which are space framed chassis under fibreglass shells, running methanol fuel. 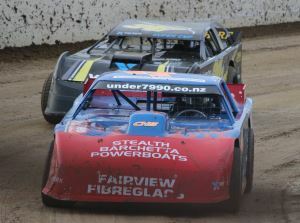 The open wheeled classes are built for speed, the Sprint car is the fastest car on clay in New Zealand with engines producing around 900+ horse power, they are an international grade and drivers can compete around the world. The bike grade consists of solo bikes and side cars which have a competitor swinging on the bike to alter the balance around the race track, swingers are either very brave or completely nuts to be hanging just millimetres off the ground. Speedway is considered an amateur sport in New Zealand but provides a strong economy for engine builders, race gear and after- market race part suppliers; it is very much a community based sport with many involved in one way or another. 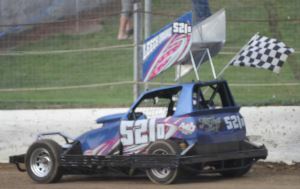 The earliest age to start racing is 8 years old which is the Quarter Midget grade (small motor bike engine in a midget type car,) while the biggest grade in the country is the Youth Ministock class for kids aged 12-16 years old, adult classes start at 16, some grades are regional/development classes and don't have NZ championships, while the main classes have NZ championships, Grand Prix's and North/South Island titles hosted around the country, the top 3 place getters at the NZ title meeting get to run 1,2 or 3nz on their cars until the following year's championship.